In meeting codes, remember to match fire rated framing and glass. Codes set requirements both fire rated glass and framing. In fact the entire assembly must meet code requirements. This article discusses fire rated framing requirements based on current IBC code requirements and NFPA, ASTM & UL test standards. Mismatched fire-rated glass and framing happens more often than you think. Failing to confirm that the tested and listed performance capabilities of the framing system match those of the glazing can result in a financial nightmare for the building owner, the architect, the General Contractor and their subcontractor. Simply put, the entire assembly must fully meet the requirements of the code. Fire protective framing is allowed where codes allow fire protective glazing tested to NFPA 252/257. When codes require fire resistive glazing to meet ASTM E-119/UL 263 requirements, fire resistive framing must be used, and the entire assembly must meet the same rating requirement as the wall. So why is it that we see fire protective hollow metal frames used in stairwell enclosures, fire barriers or other applications where fire resistive assemblies (both glass and frames) meeting ASTM E119/UL 263 are required? Here are a few reasons behind the confusion, and how costly mistakes can be avoided. 1. Even though standard hollow metal frames are listed up to 90 minutes, they cannot be used in many 60 and 90 minute applications. Like fire-rated glass, fire-rated framing must be listed with a nationally recognized testing laboratory (like UL and Intertek/Warnock-Hersey) to confirm testing to code reference standards. However, documented testing in accordance with a particular standard that results in a particular performance level is only the first step. For example, a listing for hollow metal framing may indicate compliance with NFPA 252/257 test standards up to 90 minutes, but building code occupancy types and size limitations may require that fire-rated frames installed with fire-rated glazing must also be tested to ASTM E-119. Or here’s another example: sidelites/transoms surrounding a 90 minute temperature rise door must be installed with fire resistance-rated glazing tested as an assembly to ASTM E119 and be rated equal to the wall. And because hollow metal frames only meet NFPA 252/257, they cannot be used in applications requiring ASTM E-119 even if they comply with the necessary fire rating. Table 716.5 in the 2012 IBC lays out the code requirements for sidelites and transoms, as well applications when ASTM E119 is required. 2. Many are confused about what constitutes as an assembly. 3. Sidelite/transom and interior window applications using hollow metal frames over 45 minutes are limited. Per the 2012 IBC Table 716.5, the use of fire protection-rated glazing in door vision panels is limited to a maximum size of 100 sq. in. for fire door assemblies having more than a 45 minutes (or ¾ hour) fire-rated protection listing. (4)Hollow metal frames tested to NFPA 252 that include sidelites and transoms are limited to openings requiring a rating of 45 minutes or less. 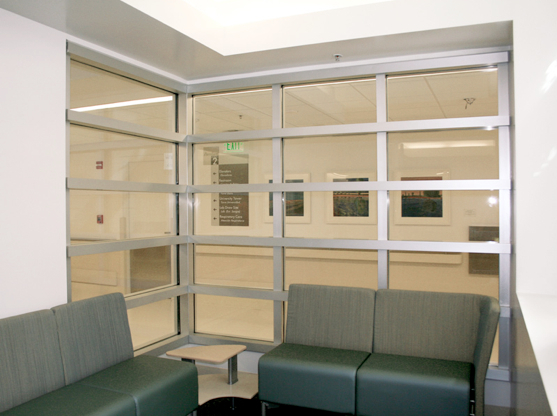 The hollow metal frames cannot be used 60 and 90 minute door assemblies that include sidelites and transoms, such as the ones found in 1-2 hour exit enclosures, stairwells and fire barrier walls, where fire resistance rated glazing ASTM E119 is permitted when tested as an assembly meeting ASTM E119. What about 45 minute window openings in 1 hour exit access corridors or other 1-hour fire partitions/barriers that exceed 25% of the wall area? In order to exceed 25%, the glazing must be fire resistance-rated and equal to the rating of the wall. (5)The framing must also be fire resistance-rated, once again limiting the use of hollow metal frames in this instance. Note that in most 1-hour fire barrier applications (e.g., 1-hour exit enclosures and exit passageways), 45-minute rated fire windows are not permitted, but fire resistance rated glazing assemblies are allowed. 4. Misconceptions when sprinklers are present. What effect, if any, do sprinklers have on code requirements for fire-rated assemblies? In particular, what do the codes say about glass and framing used in 60 and 90 min. door assemblies in exit passageways and exit enclosures? Although temperature rise doors are not required in these applications where the building is fully sprinklered, fire protection-rated glazing in 60 and 90 minute door vision panels are limited to 100 sq. in. due to radiant heat concerns. (6) To exceed 100 sq. in. in the door vision panel, fire resistance-rated glazing rated 60 and 90 minutes equal to the door must be used. Sidelites and transoms in exit passageways and exit enclosures, however, must meet a higher standard and be rated equal to the wall. Consequently, hollow metal sidelite and transom frames tested only to NFPA 252 are not permitted even if the building is fully sprinklered. 3.3.50 Fire Door Assembly. Any combination of a fire door, a frame, hardware, and other accessories that together provide a specific degree of fire protection to the opening. 3.3.51 Fire Door Frame. A component forming the perimeter of an opening in a fire door assembly that is supplied welded or knocked down and anchored to the surrounding structure. 3.3.52* Fire Door Frame for Lights. A frame that, in addition to a door opening, contains an opening(s) for use with glazing materials. Fire Door Assembly. Any combination of a fire door, frame, hardware and other accessories that together provide a specific degree of fire protection to the opening. D.10 The hourly designation indicates the duration of the fire test exposure and is known as the fire protection rating. Fire protection ratings of windows meeting this standard should be as determined and reported by a testing agency in accordance with NFPA 257, Standard on Fire Test for Window and Glass Block Assemblies. (See ANSI/UL 9, Standard for Safety Fire Tests of Window Assemblies, and CAN4-S106-M80, Standard Method for Fire Test of Window and Glass Block Assemblies.) Fire resistance glazing can be installed in a window tested in accordance with NFPA 257. However, fire resistance glazing installed in a hollow metal frame is not a fire resistance rated assembly. Fire resistance rated assemblies must be tested in accordance with ASTM E119, Standard Test Methods for Fire Tests of Building Construction and Materials. sidelights, or both, shall be permitted where a 3/4-hour fire protection rating or less is required in accordance with Table 716.5. Fire door frames with transom lights, sidelights, or both, installed with fire-resistance-rated glazing tested as an assembly in accordance with ASTM E 119 or UL 263 shall be permitted where a fire protection rating exceeding 3/4 hour is required in accordance with Table 716.5. The purpose of this section is to address the use of fire-resistance-rated glazing in fire door frames with transoms or sidelights where the fire protection rating exceeds 3/4 hour. For instances where the required rating is 3/4 hour or less, fire protection-rated glazing meeting the test requirements of NFPA 252 shall apply. Fire-resistance-rated glazing is required where the required rating exceeds 3/4 hour and the assembly must be tested in accordance with ASTM E 119 or UL 263. Testing the assemblies to these criteria exposes the glazing to the appropriate temperature rise to substantiate the higher fire protection rating. 5716.6.7.1 Where 3/4-hour fire protection window assemblies permitted. Fire-protection-rated glazing requiring 45-minute opening protection in accordance with Table 716.6 shall be limited to fire partitions designed in accordance with Section 708 and fire barriers utilized in the applications set forth in Sections 707.3.6 and 707.3.8 where the fire-resistance rating does not exceed 1 hour. Fire-resistance-rated glazing assemblies tested in accordance with ASTM E 119 or UL 263 shall not be subject to the limitations of this section. 716.6.7.2 Area limitations. The total area of the glazing in fire-protection-rated window assemblies shall not exceed 25 percent of the area of a common wall with any room. The area limitations for interior fire windows vary from those found in Section 707.6 for fire barriers. Openings of all types in fire barriers are limited to 25 percent of the length of the wall while this section bases the limitation on fire windows to the area of the wall; therefore, when dealing with a fire barrier, both the 25-percent length and area would be applicable. When dealing with a fire partition, only the area limitation would apply. Glazing In doors. Fire protection rated glazing in excess of 100 sq inches (0.065 sq. in.) is not permitted. Fire resistance rated glazing in excess of 100 sq inches (0.065 sq. in.) shall be permitted in fire door assemblies when tested as components of the door assemblies, and not as glass lights, and shall have the maximum end temperature rise of 450 degrees F (250 degrees C) in accordance with 716.5.5.